Our 22-bed, locked-door coed unit provides each patient with an individual bedroom. This arrangement assures privacy and promotes a therapeutic environment. We offer shared bathrooms. 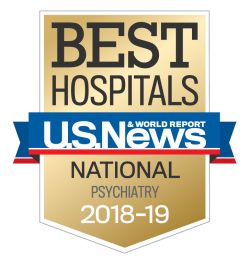 In the inpatient unit, our expert team provides leading-edge treatments for trauma-related disorders. We offer one-on-one psychotherapy with a treating psychotherapist, as well as a variety of group therapy sessions. Learn more about trauma therapy. The average length of stay on our unit is about 28 days. However, we are not a “28-day program.” Some patients do not stay as long as 28 days, and others may stay longer. This depends on numerous factors, including clinical issues, insurance certification, and more. To make your stay as comfortable as possible, we recommend you bring items that can help you feel at home. Please see the FAQ for list of items that are not allowed per Sheppard Pratt hospital policy. If you bring anything on this list, we will have to place these in your luggage until you are ready for discharge. Throughout your stay, staff monitors all belongings to confirm that they are safe and appropriate. If a safety issue arises, we may remove some items, making them unavailable until your safety issues have stabilized sufficiently. Any items marked with an asterisk (*) must be kept at the nurses’ station and signed out for personal use at the discretion of the nursing team. Food and snacks. Non-microwavable food items must be in their original packaging, labeled, and kept in the pantry area. Per hospital policy, following government guidelines, food items may not be kept in patient rooms. Any items brought by visitors should be limited to a quantity that you can eat within 24 hours. Notify staff of any food allergies or specifications (e.g., gluten-free, dairy-free, vegetarian) before admission. MP3 player or iPod. Note: We do not permit headphones and earbuds. Please be aware that hospital policy forbids computers, iPads or similar devices, cell phones, and any item that can connect to the internet, or contains a camera. These will be stored in the security office or in your luggage. Please do your best to complete internet based financial tasks: e.g., bill payment, mortgage/rent, etc. before admission, as you will not have routine access to the internet. One piece of luggage. We will send home any excess items or baggage. Liquid toiletries (e.g., shampoo, lotion) must be in clear bottles with manufacturer labels in place. Note: If containers are not clear plastic, or liquid is too dark to see through, items will be kept in the nurses’ station and dispensed into small cups for each use. If you have questions about the level system at Sheppard Pratt, please inquire/have your referring provider inquire of the admissions coordinator. A referral to the inpatient trauma disorders program begins when the referring provider contacts our admissions coordinator at 410-938-5078 or 800-627-0330, ext. 5078. Treating clinicians must download, fill out, and fax us a completed referral packet [PDF]. Our fax number is 410-938-5079. We do not accept referrals by email, as our email is not encrypted.